We learned 2 vowel points: ah as in father, and the long e sound. 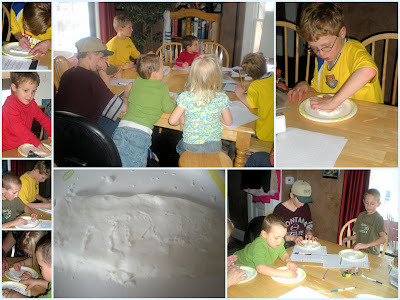 The kids practiced reading the letters with the vowel points and then got to write the letters they learned on homemade "clay" tablets. We also sang the aleph-bet and two Hebrew songs and were introduced to some "war" vocabulary like tsah-VAH (army) and map terms like tsah-FOHN (North), dah-ROHM (South), ma-ah-RAHV (West), meez-RAHKH (East), mah-PAH (map), kee-VOON (direction), se-MOHL (left) and yah-MEEN (right). They wrote the hebrew words on a map where they belong (North at the top of the map, etc). Over the next week, we will focus on memorizing the first five letters, how they are written and the sound they make (if any) and we will review the vocabulary words we learned. And we will practice using the map terms in our geography lessons! What are you using for your lessons? We would like to start Hebrew in January. I am needing something inexpensive.